What was it like to sit at the table in a Tudor household? Or at a great feast? To toil in the garden? Or to be ill? Receipt Books from the Folger Shakespeare Library is an illuminating insight into the daily lives of everyday people from 1575 to the late eighteenth century, with advice on cookery, common ailments, cleaning, accounting and much more, but what was a receipt book? Today’s cookery books, household and self-help manuals are colourful, stylish publications; often full of the most fashionable menus, advice on staying fit or hints on creating that showroom-home look. 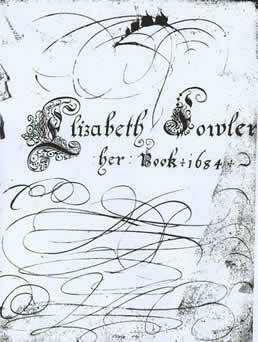 But during the early modern period things were less colourful, but just as helpful. Many women owned, or wrote, receipt books - or recipe books (from the Latin recipere: to receive or take) – which were passed down through the maternal line over generations, preserving family traditions and passing on common wisdom. These women were more than just cooks and cleaners, as they were responsible also for the household budget, the fecundity of the land and the well-being of the family. A receipt book would advise them on all manner of household tasks and was also a place to document their own recipes, tinctures and treatments. 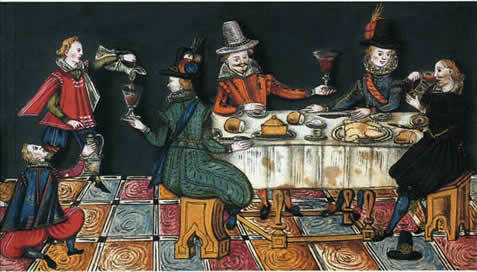 With goose, duck, pork and bread terrine (as it would now be called) on the menu, it is possible that over-indulgence was as common in the sixteenth and seventeenth centuries as it is in the twenty-first. 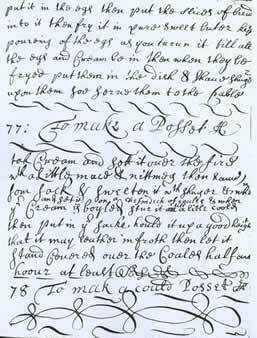 Elizabeth Fowler’s book of 1684 provides a suitable remedy to ‘cause sleepe in feavours and many other distempers’ containing eggs, nutmeg and fat which was applied to ‘the forehead and the temples’ for up to six hours. Take an ounce of deeres suet cut it small and put it into a pipkin with ½ an ounce of camphire; melt them together and take of sulphur vivum 2 peny worth, beat it very small and sift it, and put it in when the other is almost cold’. Many of the receipt books were carefully indexed, with pages numbered for ease of use, knowing that generations of women would refer to the book. Jane Blome wife of the said John Blome was borne the 18th day of February 1635. 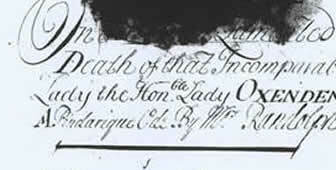 She died the 6th day of March 1696 of a palsey being 61 years of age. William Blome was borne on Tuesday the 15th day of Sept Anno 1663. He died the 10th day of December 1688 of a consumption being of the age of 25 yeas. John Blome was borne on Wednesday the 20th day of September Anno 1665. He died the 3rd day of August 1695 of a feavour being of the age 30 years. Charles Blome was borne on Saterday the 19th day of December 1668. He died the 19th day of February 1695 of the Gout or Rhymatism aged 27th years. Frances Blome was borne on the 31st day of December Anno 1669. He died the 27th day of August 1696 of a Consumption aged 27 years. Richard Blome was borne the 30th day of May Anno 1671. He died the 18th day of July 1688 of a feavour being of the age of 17 years’. These receipt books were very much the Mrs Beaton’s Household Management of their times, and more. They provided advice on cookery, medicines, the control of vermin, the cultivation of fruit and vegetables as well as conception and childbirth, cleaning of clothes, perfumes and cosmetics. These days we rely on celebrity chefs, interior designers, gardeners and health gurus to give us cooking inspiration and answers to our well being dilemmas, but in the not so distant past, women could rely on the wisdom of their mothers and grandmothers. Folger Receipt Books, c1575-1800 from the Folger Shakespeare Library is a fascinating window into the lives of the ordinary family, their tastes, illnesses and households. Click here for more information on the Folger Shakespeare Library and their collections.